Peanuts Salmon Steak is a flakey perfection of salmon that is covered in a savory peanut marinade and topped with chopped peanuts. Crunchy, savory, and downright delicious down to the last crumbs. Best of all this is a really quick weeknight dinner for all you seafood lovers out there. Nothing beats a good salmon in my books. Flakey, tender and moist salmon is always such a delightful and healthy dinner. With this homemade peanut marinade, you get a nutty aspect that pairs nicely with the salmon. Did you know that researchers have proven that fatty fish like salmon contain high levels of vitamin D! This is a vitamin so many of us are lacking or could use more of in our daily lives? If you buy wild caught salmon it will contain the most vitamin D, but you are welcome to settle for farm raise which has about 25% less vitamin D than the wild caught. But some is better than none! The beauty of salmon steaks is you can pair with almost anything. Buttered pasta, crisp green salad, steamed or roasted vegetables, and the list goes on. Even a risotto or rice would be a nice pairing to this peanuts salmon steak! 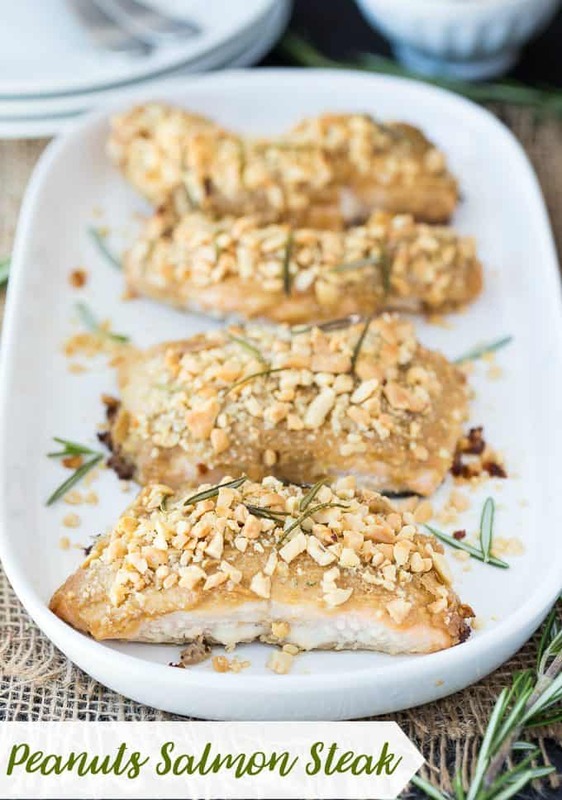 For this Peanuts Salmon Steak recipe, you want to bake your fillets for around 20-25 minutes. This is a speedy cooking meal, that doesn’t take too much prep. So in a little over 30 minutes you have one incredible dinner for you and your family. Salmon is a protein that is all about your personal preference. Many like to serve salmon slightly undercooked, where it offers a more flaky texture. Others like to have their salmon more well done. To know when salmon is fully cooked through it will provide a pink color all the way through, including the center. Just remember eating undercooked protein can make you sick, so I always suggest thoroughly cooking your salmon before serving. Start by preheating your oven. Then in a bowl, you will want to mix your mustard and peanut butter together, until nice and creamy. Then in another bowl crush up some peanuts and panko, along with the rosemary. Mix and set aside to top your fish. Take your salmon and place on a greased baking sheet. Then pour your peanut butter sauce over the salmon and then top with your peanut mixture. Pour olive oil over the salmon and bake in the oven! Once done, remove and pair with your favorite side dishes and dive in! You will find your leftover salmon will last up to three days in your fridge when stored at proper temperature. Just reheat in the microwave or even pop back in the oven to heat up for a quick lunch or dinner the next day. It will get a bit drier over time, but the flavor is delicious. What is the Difference in Salmon Types? You will find that your store might carry one or more of the six types of salmon. From freshwater to wild caught, and all things in between. You will find each variety of salmon offers a little bit different flavor or texture. Coho is a lot milder salmon with a lighter color. Sockeye tends to be oilier than other types of salmon. As you can see each one offers something unique. Depending on the state you live in will depend on the type your store sells. Any salmon will work in this recipe. If you are a fan of seafood and have a craving for the taste of the sea, give this salmon steak recipe a try. With a little bit of prep, bake time, you have a dish that tastes better than your favorite restaurant. Plus you might even have leftovers for the next day! I am such a fan of this recipe, and I think you will too! 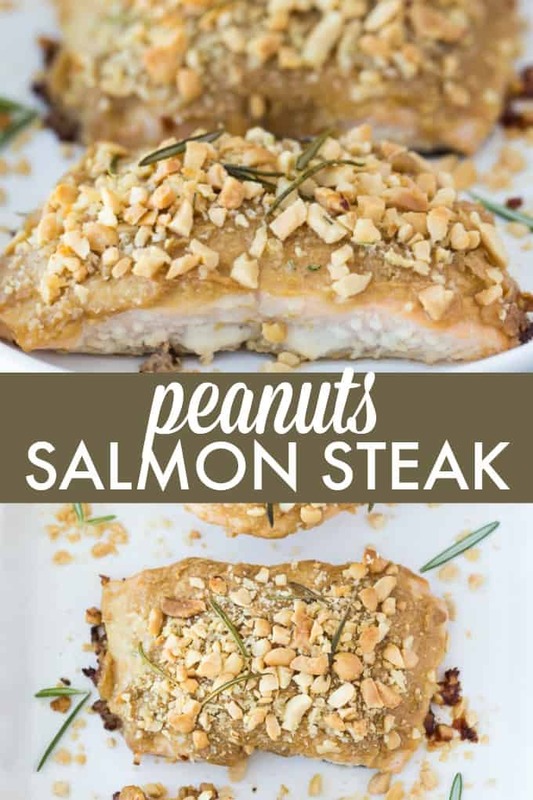 Have you tried a Peanuts Salmon Steak recipe before? Fresh salmon smothered in a savoury peanut marinade. In a bowl. Combine Dijon mustard and peanut butter. Mix well. In another bowl combine crushed peanuts and panko and rosemary. Mix well. Spread peanut butter mixture and peanuts mixture on each salmon fillet. Place salmon fillets on the greased baking pan. 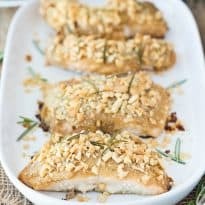 Pour olive oil over salmon fillets and bake for 20-25 minutes. I love the idea of this recipe. Can you substitute almond butter instead? This looks delicious. I’ll have to add it to the menu this week! Thanks. Sounds just perfect! Thanks for sharing with us at Funtastic Friday! Hi Stacie, your salmon looks wonderful, makes my mouth water. Thank you for sharing on the Oh My Heartsie Girl Weekly party. Your post is being featured this week on Oh My Heartsie Girls weekly party, stop by and share another fun post. See you soon!